White phosphorous (P4) is a very reactive and pyrophoric chemical. To shield it from oxygen it is stored in water. This does not mean phosphorous does not react with water. Alkaline hydrolysis yields sodium hypophosphite, sodium phosphite and phosphine. Acid hydrolysis gives phosphoric acid (H3PO4) and phosphine. Novel research by Barbaro et al. (DOI) has revealed an alternative hydrolysis route when the P4 reactivity is tuned by coordination with the organometallic complex CpRu(PPh3)2Cl, a member of the ruthenocene family. 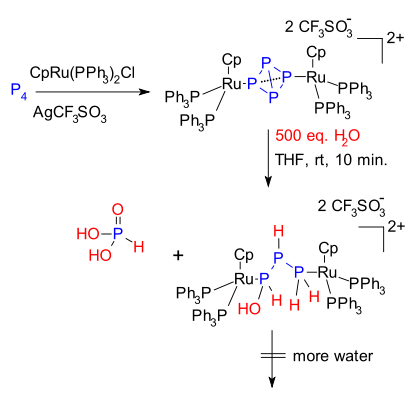 The resulting compound is found to react with water to form phosphorous acid H3PO3 and a novel air-stable phosphane complex which itself no longer reacts with water. The researchers hope this finding may lead to new chemical reagents. Hype word-count for this article: 4 (breakthrough, peculiar, spectactularly, surprisingly).